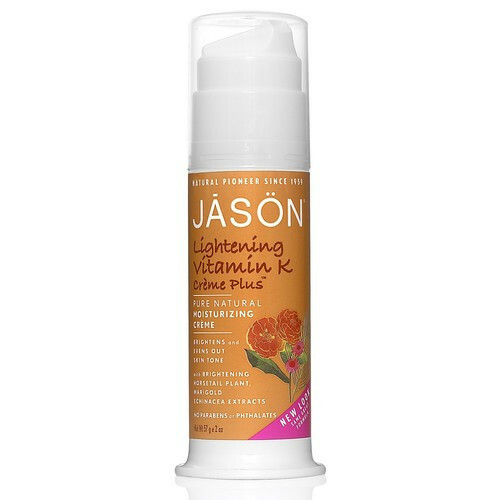 Jason Lightening Vitamin K Creme Plus helps to lighten and even out the skin tone, minimise the appearance of broken blood vessels and bruises and tone down redness and lighten under eye circles. Free from parabens, mineral oils, petrolatum, drying alcohols, lauryl/laureth sulphates, aluminium chlorohydrates, all pore-clogging ingredients. Enriched with Horse Chestnut, Marigold and Echinacea. For all skin types, ideal for rosacea and dull skin. 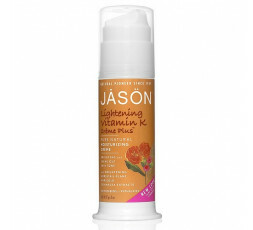 Use Jason Vitamin K Cream twice daily. For targeted treatment, clean areas of discoloration with a warm washcloth, then gently massage crème into skin. For best results, consistent use of Vitamin K creme is recommended. Aqua (Water), Caprylic/Capric Triglyceride, Cetearyl Alcohol, Phytonadione, Stearic Acid, Helianthus Annuus (Sunflower) Seed Oil*, Cetyl Alcohol, Steareth-20, Stearyl Alcohol, Ceteareth-20, Dimethicone, Ethylhexylglycerin, Glyceryl Laurate, Squalane, Aloe Barbadensis Leaf Juice*, Calendula Officinalis Flower Extract*, Citrus Unshiu Peel Extract, Echinacea Angustifolia Extract*, Equisetum Arvense Leaf Extract*, Ginkgo Biloba Leaf Extract, Carbomer, Glycerin, Glyceryl Caprate, Glyceryl Caprylate, Panthenol Potassium Hydroxide, Alcohol, Phenoxyethanol, Potassium Sorbate, Sodium Benzoate *Certified Organic Ingredient.